Muzzy Grasshopper 75 Grain Combo 3pk (111). Muzzy Grasshoppers can be fitted behind a fieldpoint for small Game or behind a broadhead for Turkey, and prevent your arrow from burying in grass or dirt. (Broadheads and Fieldpoints not included). Muzzy MX-3 100 Grain 3 Blade (MX3-3). Muzzy MX-4 100Gr 4 Blade (209-MX4-3). 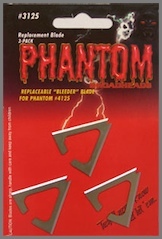 Muzzy Phantom 3 pack Replacement Bleeder Blades (3125). Muzzy Phantom MX 4 Blade 100 Grain (4100-MX). Muzzy SG-X 125 Small Game Head 3-Pack (113). 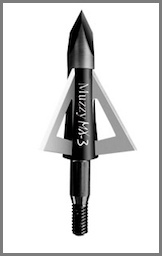 Muzzy SG-X Small Game Broadheads 100 Grain Pack of 3 (112). 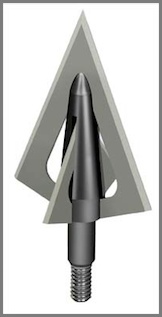 Muzzy SG-X Small Game Broadheads 100 Grain Model 112 Pack of 3 The Muzzy SG-X Small Game Head is designed to be devastatin on small game such as Squirrel. Rabbit, and Small Game Birds. It has Replaceable Trocar Tips and Spring Loaded Arms.